To send invitations via SMS and receive system notifications on your mobile phone, enter the login credentials of your Every8D.com account. The settings for this service are hidden unless you select 繁體中文 (Traditional Chinese) as the language for your web interface. To change the language, see Applications > System Appearance. This service is available only in Taiwan. Register Link to the Every8D website. Username Enter the username for your Every8D account. Password Enter the password for your Every8D account. Hard disk is full (used over 95%). Hard disk temperature is high (over 75℃). Phone Number Enter the phone number where you want to receive the system notification. 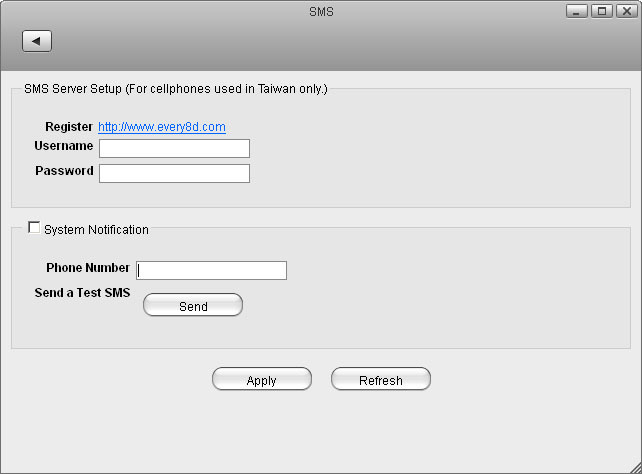 Send a Test SMS Click Send to send a test message to your mobile phone in order to confirm that the service works.